The Paithel Nercha (the feast for 12 male children) on the Easter Day at the Piravom church is very famous. The Paithel Nercha" is one of the major offerings dedicated to the church. The Function:- "12 infants will sit with the priest who sanctifies the offering and they will be feasted with delicious food". "Neyyappam", plantain fruit, "pidi", chicken curry, fish curry, rice etc will be served on plantain leaf(5 course dinner). Compared with all other churches in the whole world, the Piravom Valiyapally is the place where the highest number of Paithal Nerchas are offered. This makes the church world famous. There will be more than 20,000 "Nerchas" (offerings) on the Easter Day alone. People reach for the same even on the later Sundays too!, from all over Kerala and even from neighboring states. 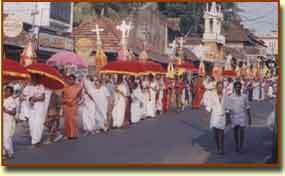 The Thirunal of St.George (Geevarghese Sahada) is being celebrated in every festivity on 7th May, every year. It is also celebrated in the 6 Chapels of the church, and also at one Kurishadi (from May 1-to-6). St. Marys Thirunnal on August 15th is celebrated in the church and also in other two Chapels. The Twelve Apostles Thirunal on June 30th is held at the Seminary Chapel. "Kallitta Thirunal" or Foundation Thirunal is celebrated at the Piravom Church with traditional rituals. It is on 8th October (Kanni 23). It is believed that the Holy Kings on their return from Bethlehem began construction of the church building on this day. The sceptre of the Holy Kings is revered in celebrations only on this day. The descendants of the servants (dependants) of the Holy Kings (Piravathu Rajakkal) are honoured with presents on this day. 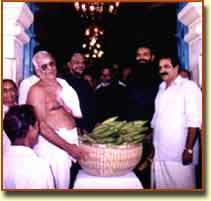 Chalassery Panickar is honoured with "Anchekalum Koppum" (5¼ idengazhi rice, coconut, pumkin, yam, and banana, one bundle of pappad, betel leaf and arecanuts) All these are arranged in a beautiful new basket and placed on a table. The function of presenting the"Anchekalum koppum" to the Chalassery Panickar is held from the very inception of the church. This seems to be the honour bestowed on him as he was the then commander-in-chief of the Holy Kings. The senior most of the nobles of the Chalassery Tharavadu reach the church on this day every year without fail and receive the present after paying homage to the Rajakkal, and the celebrations come to a close.